Regular meeting at Meades Wine bar (upstairs) on April 3rd at 7:30pm. Meades is in Oliver Plunkett Street in Cork city. This is a regular meeting schedule at Meades Wine Bar in Oliver Plunkett Street in Cork City. The start time is 7:30pm. The meeting is open to all friendly people and it is free to attend although donations are accepted (€3). The meeting is held upstairs and we do ask people to arrive on time. Don't forget to follow us on twitter to get all our updates immediately. 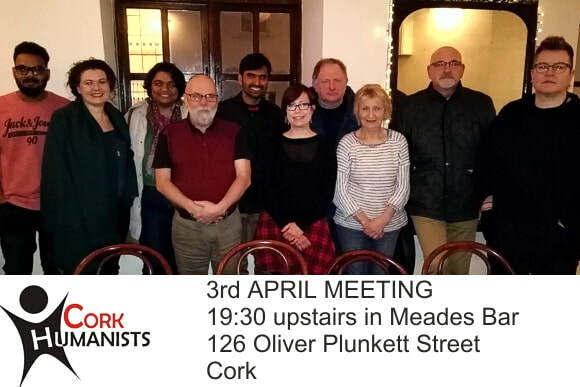 The Buddy Programme is for people who are considering coming along to a Cork Humanists event but would prefer to meet up and have a chat with someone one on one before attending an event. If you would like to be a Buddy simply reply to this email with your contact details. Preferably we would like a diverse bunch of Buddies so that when someone emails in we can put them in contact with a Buddy they have something in common with such as age, gender or whether they have children. For more information see our Buddy Progamme web page.